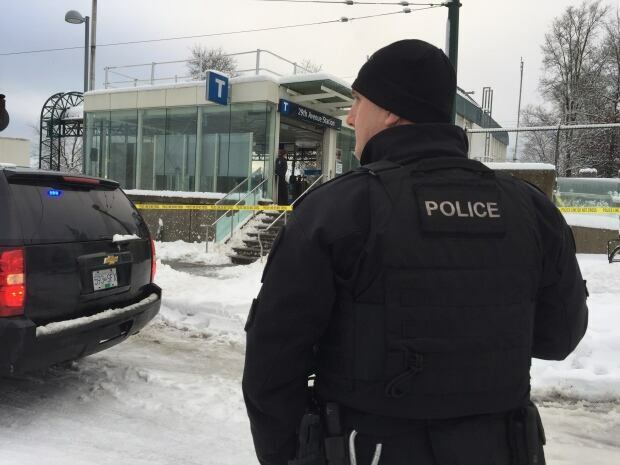 A man who refused orders to drop his weapon, shot by police, had been taken to hospital the incident took place at 29th Avenue SkyTrain station in Vanouver. According to a police statement, the shooting occurred this morning while Vancouver police officers were helping transit officers respond to reports of a man with a machete inside the station, located southeast of downtown. Cellphone video shows a man carrying what appears to be a weapon at the SkyTrain station, and shortly afterwards — off screen — there is the sound of a loud bang and the clanging metallic sound of something falling. 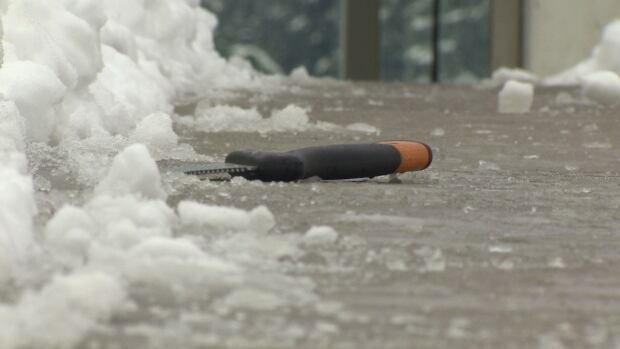 An image showing a serrated-edged weapon in the snow, outside the station, behind yellow tape. It is un-clear if that weapon is connected to the man who was inside the station. The weapon is seen in the snow outside the station. In a statement, the Vancouver Police Department said transit police were alerted around 8:30 am that a man was threatening commuters with a machete. When police arrived, the man was aboard a train. Officers closed off the area, evacuated the train and closed all the doors on the car, leaving the man alone inside. Police officers tried to negotiate with the man, but he broke through the closed train doors. Vancouver police were called to SkyTrain’s 29th Avenue station after commuters reported there was a man with a machete. He was ordered to drop his weapon, but refused, and police shot him, the statement said. The man was taken to hospital, but his condition is unknown. The incident caused delays on SkyTrain’s Expo line, which was already backed up after a snowstorm struck the region overnight. TransLink, the agency that oversees Vancouver’s rapid rail system and other transit services, said the 29th Avenue station has reopened. A passenger who was on a downtown-bound train this morning at the time of the incident at the 29th Avenue station told that she heard loud shouting as her train passed by.